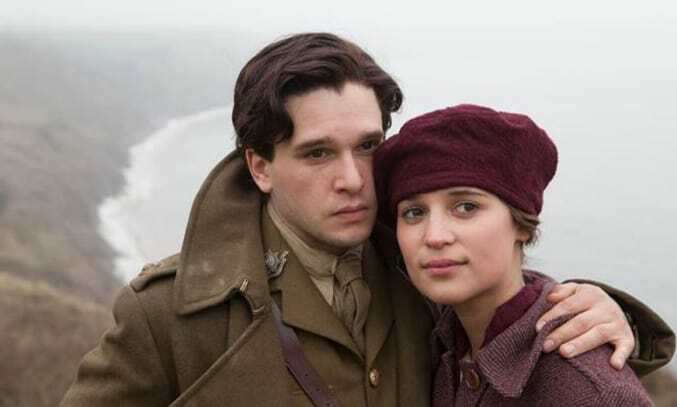 With the awards season in full swing, one film hoping to make its mark in the world of cinema is Testament of Youth, a WW1 drama film starring Alicia Vikander and Kit Harington and directed by James Kent. Based on the First World War memoir written by Vera Brittain, Testament of Youth is a searing story of young love, war and remembrance. It tells the incredible true story of one young woman’s struggle to survive the horrors of war as those closest to her are killed and her youthful hopes and dreams slip away. We were treated to an exclusive preview of the film back in October and have been biting our tongue to tell you all about it. If you watch it, you’ll understand why. The story starts in 1914 with Vera (Alicia Vikander) enjoying an idyllic country life with her younger brother Edward (Taron Egerton) and mother and father (Emily Watson and Dominic West). Privileged, intelligent and free-spirited, Vera has everything to live for including her growing love for Roland Leighton (Kit Harington), her brother’s close friend. Like Vera, Roland shares a passion for poetry and literature but their dreams of studying together at University are cut short when war breaks out and the boys leave for the front. Unable to sit idly by as her peers fight for their country, Vera volunteers as a nurse. We watch as the once free-spirited and determined young woman experiences the grief of war, as those closest to her are killed and her world is shattered. Yet despite the horrors of war, Vera’s indefatigable spirit spurs her forward to find a new purpose, to tell her own story of love, war and remembrance. Whilst it is essentially a love story, what makes Testament of Youth so special is Vera’s extraordinary spirit in the darkest of times. Powerful and passionate, director James Kent does a fantastic job of representing the infectious buoyancy, enthusiasm and naivety of youth alongside the futility, horror and visual brutality of war, with soldiers breaking the fourth wall, looking back at Vera in her mind’s eye. Rob Hardy’s stunning photography is equally brilliant, juxtaposing scenes of stunning Britain against the visually harrowing war-trenches of France, to beautiful effect. Alicia Vikander is stunning as Vera Brittain, the irrepressible, intelligent and free-minded young woman who overcomes the prejudices of her family and hometown to win a scholarship to Oxford. The 26-year-old Swedish actress carries the role with a delicacy and poise that is both commanding and elegant and her ability to capture Vera’s intelligence, emotion and inner pride is simply captivating. Kit Harington is also impressive as Roland Leighton. The actor brings an added dark edge to the tormented character who cannot look Vera in the eye when he returns home on leave, haunted by the haphazard brutality of trench life. After his action-based roles in Game of Thrones and Pompeii, it is nice to see Harington in a role that he can really get his teeth into. Vikander and Harington are joined by an solid supporting cast including Colin Morgan as Victor, the shyly sweet friend who quietly vies for Vera’s hand, Taron Egerton as Vera’s beloved older brother Edward, and Emily Watson and Dominic West as Vera’s affectionate, but stuffy parents who no real conception of what is driving their daughter. Powerful, moving and beautifully shot, Kent makes an impressive directorial debut with Testament of Youth with glorious performances from Alicia Vikander and Kit Harington. A remarkable story of war from a woman’s point of view that’s not to be missed. Testament of Youth is on general release in the UK on 16 January 2015.